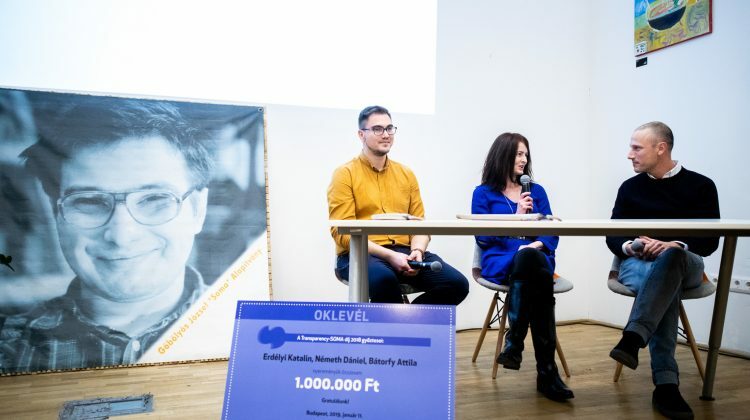 Three journalists of Átlátszó.hu, Katalin Erdélyi, Dániel Németh and Attila Bátorfy won the Transparency-Soma Prize for the best investigative piece of 2018. The award, which came along with a prize of one million HUF, was given to the winners at an award ceremony organised by Transparency International Hungary on Friday in Budapest. The jury selected the winner out of 15 articles. They chose Átlátszó.hu’s article ’Viktor Orbán, the private jet, the luxury yacht, and the Mészáros family – we know where they spent their holiday this summer’ written by Katalin Erdélyi, Dániel Németh and Attila Bátorfy. The articles were evaluated based on three aspects: the quality of the investigative work, the relevance of the topic and how easy it was to understand for the general public. The winners received the award and the one million HUF money prize at the award ceremony. The team of Átlátszó.hu followed the route of a private jet and a luxury yacht owned by an offshore company registered in Malta. During their investigation, they spotted Viktor Orbán, Hungary’s Prime Minister; friends of Lőrinc Mészáros and more politicians and businessmen connected to the government. In their article, they illustrated the results of their research with photos, videos, maps and infographics. This was the 18th time this year that Hungary’s most prominent prize for the investigative journalists was awarded. It was founded in 2001 in honour of József Gőbölyös, an investigative journalist who died tragically young. The Transparency-Soma Prize is given by Transparency International Hungary since 2016. The winners were decided by a four-member jury: András Lőke, the editor-in-chief of Ittlakunk.hu and founder of the Soma Prize; József Péter Martin, the executive director of Transparency International Hungary; András Stumpf, journalist and co-founder of Válaszonline.hu and Ágnes Urbán, head of the Department of Infocommunication at Corvinus University of Budapest.